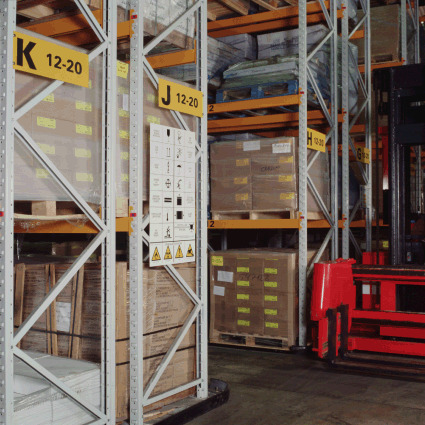 Ensure that your warehouse/stockroom meets the required health and safety standards by displaying the relevant warehouse safety signs where necessary. Each sign in our selection conforms to the very latest standards (including ISO EN 1710) and features universally-recognised safety symbols for clear and efficient comprehension. First aid box symbol and text safety sign. Unauthorised persons prohibited beyond this point symbol and text safety sign. No access to unauthorised persons symbol and text safety sign. Do not climb on racking symbol and text safety sign. Danger Automatic machinery liable to start without warning symbol and text safety sign. Risk of fork lift trucks symbol safety sign. Place all rubbish in bins provided symbol and text safety sign. Caution Risk of electric shock symbol and text safety sign. Hand protection must be worn symbol and text safety sign. Foot protection must be worn symbol and text safety sign. No fork lift trucks symbol and text safety sign. Caution symbol and text safety sign. Danger symbol and text safety sign. Caution Battery charging symbol and text safety sign. Caution Fork lift trucks symbol and text safety sign. Caution Moving parts on conveyor symbol and text safety sign. Now wash your hands symbol and text safety sign. Switch off power before changing or charging battery symbol and text safety sign. Caution Mains voltage symbol and text safety sign. First aid action safety sign. First aid symbol and text safety sign. Fire exit arrow down symbol and text safety sign. Fire exit arrow right symbol and text safety sign. Fire exit arrow up symbol and text safety sign. Fire exit arrow diagonal down-right symbol and text safety sign. Fire exit arrow diagonal down-left symbol and text safety sign. Wear disposable gloves symbol and text safety sign. Warehouse safety signs are used to highlight dangers and hazards in the workplace, indicating correct operating procedures and encouraging the use of appropriate safety equipment, ranging from handling aids to first aid kits and firefighting tools. Along with operational instructions, warehouse safety signs should also be used to advise on prohibited behaviours and actions that relate to the specific conditions of the workplace, as well as to general safety measures. In addition, these signs also assist in maintaining emergency exit procedures, which is particularly important in areas where access may be limited. If you have any questions about our warehouse safety signs or would like more information about Label Source's products and ordering systems, please feel free to get in touch!